The little girls turn two on Wednesday and the party was yesterday. Balloons and chocolate cupcakes, other little ones to play with, friends and lots of relatives (some via facetime) helped celebrate. 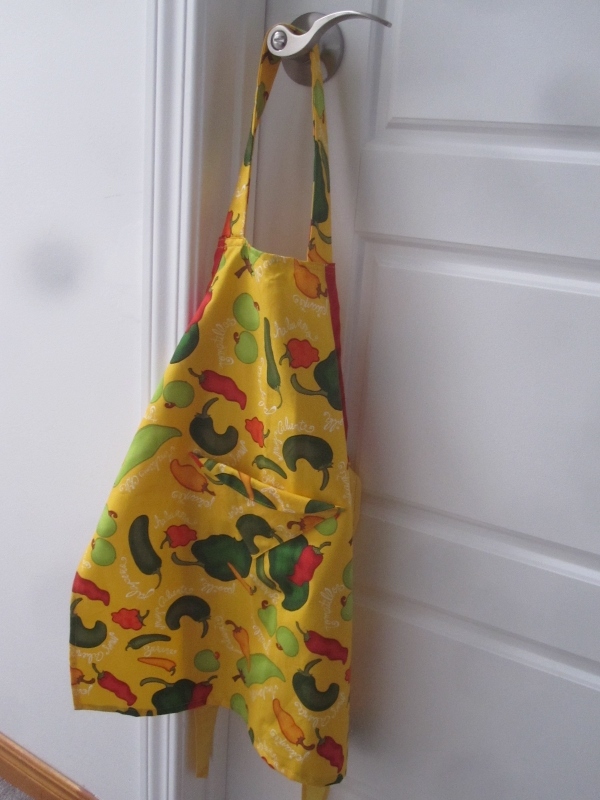 I did manage to make a couple of loaves of pulla and some broccoli salad and I even managed to make them aprons. 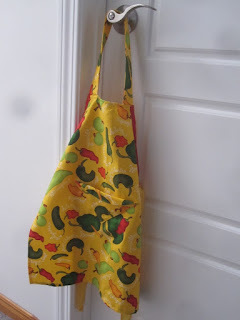 The fabric was from Len's Mill store in Barrie was only $6.00 a yard. They sell fabric by the yard or by the metre and I picked up half a metre. The pattern was a freebie from HERE and only called for a fat quarter. 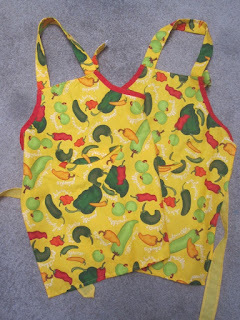 The pattern is actually for a reversible apron and so one would need two fat quarters. I didn't want to make it reversible but the fat quarter was perfect. There was no waste whatsoever. Since I bought a half metre, my fat quarters were cut out of it with some leftover on the sides which I used for the neck strap. The quarter circle that was cut out for the arms was used for a pocket - that was doubled. It's hard to see but there is a pocket in the middle of the apron (click on the photo to make it bigger.) Little ones don't use pockets much so it's mainly for decorative purposes. I hoped to trim the differently but I didn't have enough lime green bias to cover both arm sections. I left the excess fabric for the neck part so that I can adjust it if their heads grow and the strap becomes too tight. 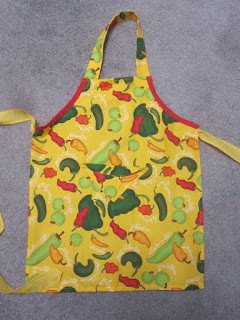 The apron itself with fit a little one for several years. I made the ties with some polyester broadcloth that I had. Very cute. And no waste is wonderful. 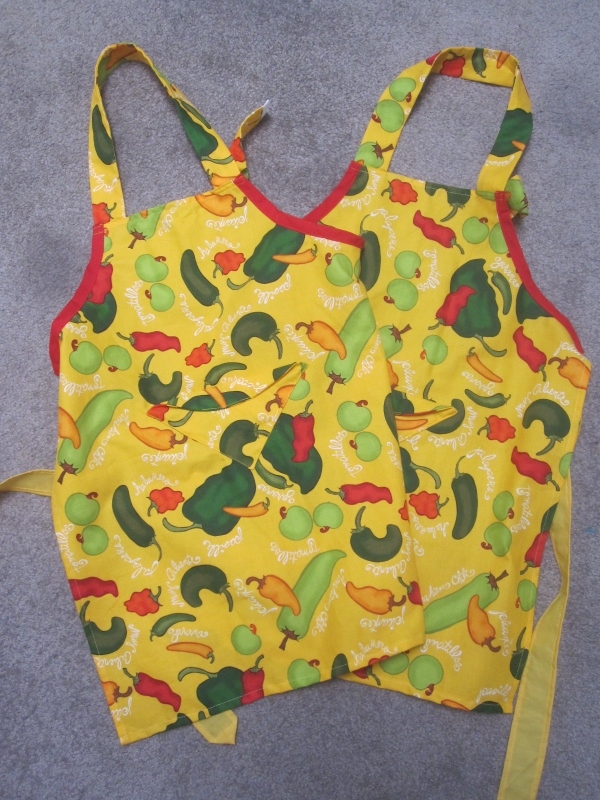 The aprons are cheerful and will fit the girls for a long time. I always make my aprons like this but with a narrow folded edge where you used the bias binding. When my kids were little I made several little aprons in red for the school Christmas fair to raise money for a school trip. Grannies bought them for their little Christmas bakers. Very cute:) Thanks for the link. 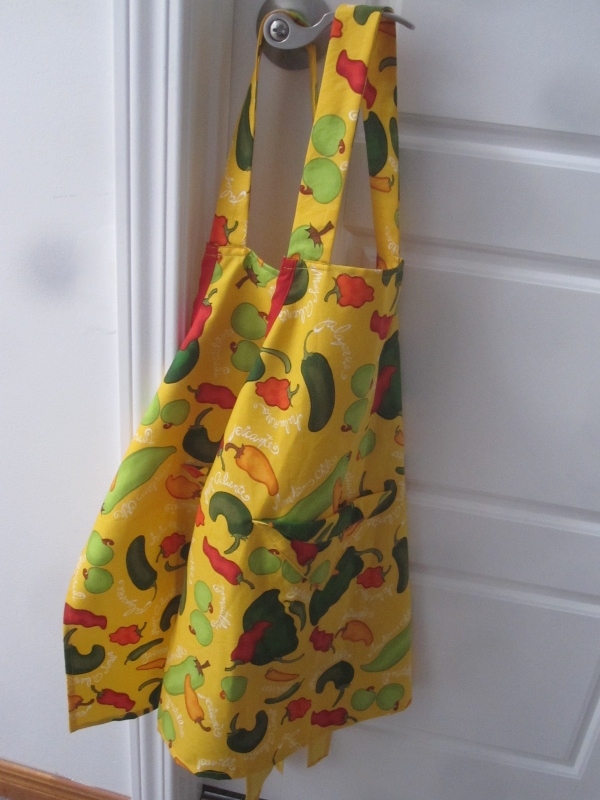 Happy Birthday to the wee ones - those aprons are just darling, Dolores!! !